So you’ve got yourself settled in your beautiful Lake District cottage or you’re heading to the Lakes for a family day out. You’ve put an order into the met office for any weather but rain, and are ready for your perfect family day out in England’s largest National Park. What could go wrong! With the open road ahead of you, Lakelovers are here to help you plan your fun day out. Number one on your itinerary when planning your perfect Lake District family day out is keeping everyone happy. You can be at an award-winning bistro, or newly-opened kids activity centre. But if you don’t plan for all eventualities – no cashpoints, limited mobile reception, seasonal shop opening times – your dream day out in the Lakes can end up a flop. The reality is when it comes to the day of your trip your fun-seeking family may consist of a teething baby, too-excited-to-nap toddler, hungry parents and over-jolly grandparents. Planning a trip to suit all can be a daunting task, but as long as you remember – plan, plan, plan! Then you’ll be heading home with a happy clan after your perfect family day out in the stunning Lake District. Find out what happened to Peter’s coat and slippers in The Peter Rabbit™ Garden at The World of Beatrix Potter. 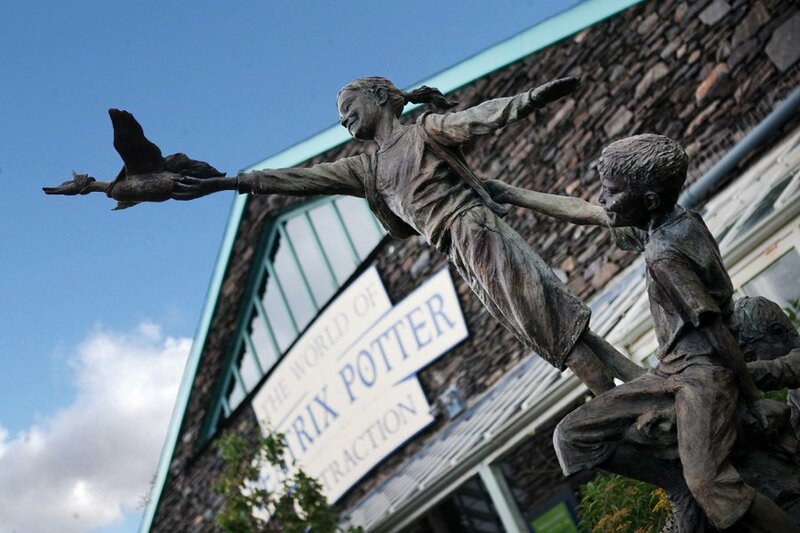 Whilst the stunning Lake District National Park with over 3,000km of open access parkland is perfect for wearing your kids out, let their imaginations run wild too at the fun World of Beatrix Potter™, in the centre of Bowness-on-Windermere. Little eyes will be wide with wonder as you make your way through the indoor magical animal-character theme park. 3D displays bring to life scenes from the adored Beatrix Potter stories. With atmospheric sounds, lighting and smells sure to delight. Which prickly character do you think is hiding behind the little door? Have a look at the website World of Beatrix Potter™, for ticket information and print this fun kids activity sheet to read on your journey to the Lakes. The attraction brings to life all 23 Beatrix Potter Peter Rabbit stories. It features interactive characters and activities, all at toddler eye-level to usher kids, from babies to children, along. The magical stories are brought to life in the adjoining award-winning Peter Rabbit™ Garden, which won a Gold medal at the RHS Chelsea Flower Show 2014. So you don’t miss anything we’d recommend leaving buggies behind during the busy Summer season. Use baby carriers if you can, leaving toddlers free to join in. The attraction is superbly executed, and will be fun for all ages. Whether you’re Peter Rabbit fans or have not yet read the children’s stories, this magical attraction will likely get you and your kids hooked on the vivid imagination of Miss Potter! The theme park is big enough to keep little people entertained for a couple of hours. By which time your little darlings – and grown-ups for that matter – will be ready for a pit stop! A family ticket (2 adults and 2 children) is £18.50 and we’d recommend arriving early (opens 10am) to make the award-winning family friendly café before they get too busy, especially at weekends. The tearooms are a relaxing treat for grown-ups as well as kids; local, home-grown and seasonal soups, sandwiches, cakes and scones. Various dietary needs, including gluten-free, are catered for. High chairs, baby food heating facilities and baby change facilities are all available. This the perfect start to your great special family day out in the Lake District. Alternatively, make your own Mr. McGregor picnic to have alfresco at one of the many great picnic spots along the shore of Windermere. For foodie parents, try Franchine’s brasserie–style restaurant and coffee house, which serves a fabulously fresh, healthy menu and is children-friendly. Based in the centre of Bowness-on-Windermere, this kids’ attraction is extremely accessible and perfect for heading to many other popular Lake District family activities that are close by, including cruising around England’s largest lake! Lakelovers were not surprised our spectacular Lake Windermere was voted second favorite view in the UK. (In a poll by DigitalOutdoors in 2014). And what better way to discover the splendid mountain scenery? To explore secluded bays, the wooded islands and England’s largest lake than from onboard one of the Lake District’s iconic steamers? It is only a half mile of easy, toddler-friendly walking from the magic of Beatrix Potter. Wander past the boutique shops of Bowness-on-Windermere. Walk along the lake shore, past the bustling Pier, where you’ll get a real holiday feeling, and arrive at Windermere Lake Cruises. If you’re driving, Braithwaite Fold is a long stay car park, and remember to show your ticket at Lake Cruises for partial refund. There’s a Visitor Centre nearby for emergency toilet and snack stops! The cruise is a year-round Lake District activity, with each season offering a different experience. Opening views as leaves fall, colours and atmosphere change from blossomed hillsides of Summer to mesmerising reflections and snow-capped peaks in the Winter months. Although the steamers are equipped for all weather, open top and fully covered vessels, to get the best value from your trip, ideally you want to avoid wet months. Though also be aware Summer months can be busy and don’t forget to pack suntan lotion! For young families in particular, we’d recommend the 45 minute circular ‘Island Cruise’, other cruise times varying from 70 to 90 minutes. Under 5’s travel free and the family ticket, for two adults and three children are £20; great value for seeing homes of the rich, including Beatrix Potter. Kids will love watching the ‘Master of the Ship’ guide passengers across the sometimes choppy waters. This fun short cruise runs from late morning all day with the last departure at 16.45. “Bring some binoculars with you (for you or the kids). They’re great for watching the lakeshore wildlife and places of interest mentioned in the on board commentary,” thanks for the helpful tip Windermere Lake Cruises! Cramming too much into a day out with the family is definitely a big no-no, so why not finish your special day with a ‘journey home treat’ for the kids from expert toy shop Toys and Hobbies on Lake Road. It’s not hard to see why families return time and again to the magic of the Lake District. Welcome endless adventure, in peaceful and inspiring surroundings. What creatures did you spot during your day? Please send in pictures and we’ll post them on our Facebook page. Parents, if you’ve got any tips or advice for other Lakelovers, please leave comments below and we will add.